The wind direction was one of the best we have had for some time with a usually fairly true beat to windward, with tricky shifts but not many violent changes of direction. This did offer real opportunities to win or lose places and most did! Allen Pearce arrived early on and very kindly scored the results, a great help, Thanks to Allen. No breakages today all boats worked well. So we completed 11 races by 12 noon with the event going at a good pace. KC for once with his 95 was in good form with 5 firsts and good follow up results at the top of the fleet. Mike Kemp also had 5 firsts but became entangled with the odd boat on odd occasions which led him to come in in second place with Keith on 15 points and Mike K on 18, a narrow margin. John Simmons had a bit of an up and down day but finished in third place on 31 points. It was a really good sailing day giving good competition with the gate making things very interesting! Just five boats out yesterday. One regular representing our club at an IOM ranking event down south, one in Washington DC giving advice to the POTUS, maybe three who raced the Wee Nips on Saturday and couldn’t negotiate a second weekend day of sailing and a couple, Alex and Brian, I know not where. So five is OK, could have been twelve boats out! Anyway, we arrived to a WNW direction (not as forecast) which meant a short beat into the western bay out to our mid lake pair and repeat without the spreader. It was terrible with massive changes in wind strength even for boats almost next to each other. It was truly a lottery with three different winners and boats maybe first in one race and last in the next. Thankfully the wind swung to the forecast NW from race 4. This meant a start from the right hand bay. But we had no start mark (red 5) as this was dragged to the bank after a rescue on the Friday. Note to Committee this needs replacing asap with NW winds forecast towards the end of this week. However we improvised with a distant red 7 and a tool box on the jetty! We sailed out to the windward mark just off the western island to starboard out to a spreader with a run into the right hand bay to red 8 to port and repeat without the spreader. The final beat from red 8 to the finish provided some tense moments! Rob Tottey started well but his boat lost some set up for races 3 to 5 but improved after a fiddle! Today was a second chance for the DF95 fleet to hit the water this weekend but the wind had moved somewhat so we had to find a new course to use the wind which was verging on 'B rig' at times. This time we went from the white marks 5 and 6 just off Paul's Spit and headed for Orange 5 in the mouth of the bay which we took to starboard for a change. We then reached, sort of, out to Orange 4 also taken to starboard and headed for the gate from where we returned to Orange 5 and back to the gate before finishing between White 5 and the edge of 'Paul's Platform'. For the first few races we tried a start further out in the lake between white 6 and 8 and used white 8 as the leeward mark before finishing between Orange 5 and the rescue boat parked on the bay side of Paul's Spit; this became Orange 5 and a pair of Mike Ewart's trousers - not the ones he was wearing - after the rescue boat had to be called to action. It was required to help retrieve Richard Dolan's yacht after it became disabled following a collision which set its rudder at right angles. One race later Richard retired his yacht after the rudder servo was observed faltering and making unusual noises suggesting that it had been overstressed somewhat by the excessive movement during the collision. Richard gamely stayed on to become 'Race Officer' and scorer. There were several collisions and activities of note during the twelve races achieved in the brisk but changeable winds. Apart from mark rounding collisions where an incoming yacht was suddenly confronted by a yacht which a few seconds earlier was expected to have 'moved on' but came to a halt as the wind decided to change, there were windward / leeward incidents; incidents where yachts finished were getting in the way of yachts still racing, and one where a yacht apparently on target for a win was 'taken out' by another in a give way position. The finished / still racing incidents reminded us of similar situation during the recent I0M Nationals at Fleetwood where the 'finished' offenders were warned that any further such incidents would see the finished offenders summarily disqualified. The other, involving Mike Ewart and Paul Risdale, impeded Mike sufficiently to allow Mike K. to slip through and finish first. There were mutterings that Mike E. should claim for redress of, perhaps, a score equal to his morning average. Even if this had gone to a protest committee and they had found in his favour Mike would have ended the morning with a total of one point less than the 20 that saw him very firmly in second overall for the event. Overall the morning was characterised by close racing and numerous close finishes with boats crossing the line in very close order. That's the last time Furzton will see a DF95 for nearly two weeks - Fishing Festival next weekend: I wonder if the fish know what they are in for? Two boats, John Simmons and Richard Dolman used A rigs (as they did not possess a B rig!) and the rest were on B rig. Although we did have some very strong gusts actually we didn’t have that many and the A rig guys were OK in the main. Mike Ewart started a bit slowly but half way through the racing he took a required tablet and wow it did make a difference! After race 5 he won 5 of the remaining races. John Simmons (nice to see him at the lake) sailed very consistently with nothing lower than 3rd place after discards. KC had a mixed bag of results with a not so good second half. Maybe a tablet was needed! Sunday dawned and some of us expected to be making the trek around to the spit to use the forecast WNW wind of 2 to 6 mph. That wind caught us out again, being largely NNW as and when it decided to bless us with its presence. Consequently we went from a start off the right hand 'normal' launching platform, out to the grey topped orange mark, back to white 3 and into the RH bay, out to the grey topped buoy, back into the bay and to finish across the same line where we started. Racing went from a virtual standstill to a brisk pace, in line with the wind strength: the windward mark was a challenge as the wind varied in both strength and direction. As it has been for the last few DF95 sessions there was an assortment of winners and everyone finding themselves in all sorts of positions throughout the races. There was a degree of excitement during the last race as Keith made a 'too close' pass at the windward mark and hooked his fin and bulb on the buoy anchor line. We all gave him a wide berth during our circuits and then turned to unhooking after we had finished. Mike Ewart launched his rescue boat and, after circling and making several attempts to gently ease 55 away from the buoy took a slightly more aggressive approach only to find the rescue boat 'beached' between the mark and Keith's shiny new 95. The dinghy was retrieved from its cupboard, inflated and Rob took on the role of rescuer of both the rescue boat and number 55: by this time the morning was over so racing was concluded. This morning saw two brave, or crazy, souls meet up at the lake. They looked at the water and concluded that the wind strength was somewhere between 'B' and 'C' suit, with whitecaps appearing on the more open parts of the lake. It was cold with frozen snow on the ground, just the time for a chat about how Paul and Mike K. got into sailing which revealed that they both got the taste for sail with a 575, that'll get some wondering. Anyway, at around 10:10 they concluded that no one else was coming to play so the safety gear and starter were put away and both retired to work on their Six Metres. Round Four of the Commodores Cup competition was abandoned without a sail being seen. What a relatively fine morning for sailing: no rain, warm for the time of year, and wind. The latter was not as strong as most expected on arrival but still enough, in places, to support the 'B' rigs settled on by Alex, Paul and Rob: those of us who elected for the 'A' rig were occasionally flattened or forced to broach downwind but such is the flexibility of the DF95 that we survived OK.
With a nominally South-West wind we had the 'long march' to sail off the spit starting between 8 and 4 (I think), beating up to Red 2, turning to Port and heading down to the White bouy between the shore and the right-hand island, passing around the Orange at the mouth of the right hand bay on the first lap. From there we made our way back to the windward mark - the really challenging part with a whole range of paths, all of which could see one suddenly in a 'no wind' zone whilst others sailed by. After returning to the leeward mark once more it was a fight to the finish line, an apparently innocuous single port tack away - but with enough distance to see positional changes and several very close finishes. Racing was generally pretty close, although those finishing in first place almost always had made the significant break from the rest between the start and the first mark leaving them to fight for the mid-order places. Similarly, the last place was often decided by some mishap or misdemeanour at or near the first windward mark after which the 'pack' seemingly streaked away. There was enough wind going spare for Mike Ewart to give his Romanza (6 metre) a trial sail after recent re-engineering of some of its controls: it seemed to be doing pretty well in the blustery conditions. 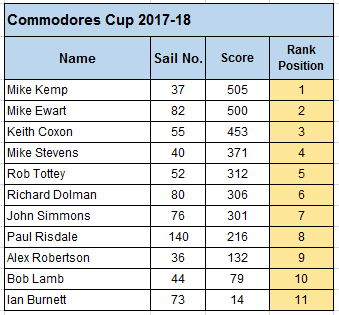 This is a short note to keep you up to date on the state of the Commodore's Cup (DF 95) after round one which was scheduled for this morning. I also owe you all an apology for the Friday results - I mistakenly circulated the Excel workbook when I intended to send out a .pdf. The is now attached here.